This sky map shows the location of the Draco constellation in the night sky tonight at 9 p.m. local time as viewed from mid-northern latitudes. The annual Draconid meteor shower appears to radiate out of Draco each year. The Draconid meteor shower is created each year when the Earth passes through a trail of dust left over by the comet 21P/Giacobini-Zinner, an icy solar system wanderer that orbits the sun once every 6.6 years. In 2011, the Earth passed through a dense patch of comet debris and spawned an impressive Draconid meteor shower for some lucky observers, with up to 600 meteors per hour that - while faint - were still amazing, Phillips explained via Spaceweather.com. But last year's display may have been disappointing for observers in North America since it peaked during daylight hours, with the nighttime observing period spoiled by the bright moon. Phillips said there is no reason to expect an amazing Draconids display on par with the 2011 event. On average, the meteor shower creates between 10 or so meteors an hour, he added. Find a dark place: It seems like a no-brainer, but clear, dark skies away from the interference of city lights offer the best chances for meteor-seeking night sky observers. Get comfortable: Sitting upright with your head craned upward can get uncomfortable after awhile. A reclining lawn chair may be a better bet. Dress warmly: The Fall season is in full swing for Northern Hemisphere observers so a few extra layers to ward off the evening chill is a good idea. 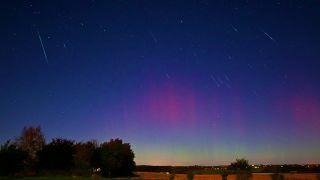 Time it right: According to New York meteorologist Joe Rao, SPACE.com's night sky columnist, the Draconid meteor shower are a bit unusual when it comes to the best observing time. For most meteor showers, the optimum time for observation is around the midnight hour, but the Draconids tend to be at their best in the evening time just after dusk, Rao has explained in the past. "Their radiant (apparent point of origin due to perspective) is highest after dusk; it moves lower throughout the night and is near the horizon at dawn," Rao wrote ahead of last year's Draconid display. Editor's note: If you snap an amazing Draconid meteor photo tonight and you'd like to share it with SPACE.com for a story or image gallery, send images, comments and location information to managing editor Tariq Malik at tmalik@space.com.